Thank you so much, Wendy, and all my friends and colleagues in this room and in the AALS, including my Executive Committee colleagues, my fellow officers, and Judy Areen, our Executive Director, for this opportunity to serve as AALS President. I am honored and humbled. I also want to thank my spouse, Bob Taylor, for his loving support, and the superb AALS staff, who do so much to assure smooth functioning of this meeting. Wendy Perdue’s theme, building bridges across increased polarization, is not just for her year but for our era. Today, I want to extend her engineering metaphor, to discuss the role of legal education in strengthening the pillars of U.S. constitutional democracy. Is our constitutional democracy at risk? After all, we continue to have regular elections; civilian courts checking the government and deciding private disputes; strong voices of public contestation—and law schools that, in recent decades, have become more inclusive, and encouraging of public interest and public service work. But constitutional democracy can be put in jeopardy in different ways—by a single dramatic act of rupture—or, I worry, by a concurrent weakening of its pillars. I discuss three: first, law and its institutions, second, elections and representation, and third, the knowledge institutions of which we, as law faculty, are a part. While the idea of government under law has been central to our constitutional tradition—protecting individuals, groups, markets—we are today seeing unprecedented attacks on judges by public officials. Personal attacks intended to intimidate or delegitimize judges are quite different from criticism of a court’s judgment. What to do? 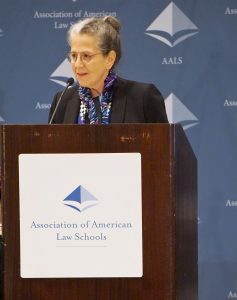 One important answer is for law schools to keep on keeping on—training students in legal analysis of cases and statutes, in how to design fair processes, in understanding both sides of an issue, in appreciating the role (and limits) of courts, and in lawyers’ obligations to clients and the public good, encouraging speaking up for justice and against departures from law. But we also might examine our curricula, to see if we are providing students with the knowledge that supports good legal process in all parts of our government. Our students, after all, will not only be lawyers and judges but, in disproportionate numbers, they will be (if past is prologue) our legislators—local, state, and federal—our Governors, and our Presidents. In addition to law-making and law-applying norms and institutions, then, a second pillar of constitutional democracy is fair voting and representation—with law laying down rules in advance—about who can vote, for what candidates, for which offices (and, perhaps, for the powers of those offices). But law can be used to obstruct, as well as to support democracy, as with the recent wave of franchise restricting laws. Carol Anderson, in One Person, No Vote, calls attention to the interacting, systemic effects, for example, of new voter I.D. requirements and the closing of regional motor vehicle bureaus, making it harder for poor people to obtain now-needed forms of identification. Voter suppression is not legitimate in a constitutional democracy. And as legal scholars, we can explore how an “unconstitutional state of affairs” (to borrow a phrase), arising from such systemic effects, may threaten representative democracy. As legal educators we should ask: are we doing enough—in our teaching and scholarship—to explore the importance of fair electoral institutions and the norms of political reciprocity on which a decent democracy must rest? Where having an opposition is understood, not as criminal, but as democratically necessary? Where those in power today must govern and compete, knowing that, tomorrow, they may be out of power? Survey data suggests that too many are losing faith in democracy—increasing numbers do not think it is important to live in a democracy, and support having a “strong leader …who doesn’t bother with … elections,” and even believe it would be a “good” thing for the military to take over. [Foa & Mounk (2016), Pew (2017).] Are failures of representation responsible? We provide students with thick, normatively contested ideas of what it means to be a good judge—but our law school curriculum has focused less on the role of a good elected representative—leaving a normative void that reinforces a perhaps over-determined downward spiral in public officials’ conduct. Responding to the multiple pulls of constituents, party, and policy is truly hard, in ways we too often ignore. Perhaps the first-year curriculum should consider basic questions about representative democracy and its alternatives. Let me turn to a third pillar—what I call knowledge institutions—colleges, universities, law schools, a free press, and NGO and government offices devoted to gathering data and disseminating that data to the public. Totalitarian governments require their people “to live a lie,” in the words of Vaclav Havel, Czech writer and statesman. In a true democracy, knowledge creation and diffusion hold a central role, so that decisions on who to vote for, what to preserve, and what to change, can be based on accurate understandings. Self-governance requires informed voters, whose opinions rest on shared knowledge—not “truthiness”. We as law faculty are a central part of this epistemic base. George Washington, as President, argued repeatedly for a national university to educate citizens in knowing their rights, knowing the law, knowing how to evaluate their representatives, and understanding government. Where better to meet these critical needs than in our law schools? Higher education—of which we are a part—faces real challenges. There is a new partisan divide about whether higher education is good for the country. In a 2017 Pew Survey, 58 percent of Republicans responded negatively, while 72 percent of Democrats responded positively; this gap, if it continues, threatens the public base of support that our institutions of higher learning need. Accessibility, especially for first-generation students, is an urgent question. A sharp drop in foreign student enrollment diminishes the educational richness of our campuses. And many believe there is a need to reinforce norms of tolerance and reasoned disagreement in public contestation. AALS Associate Director Sean Scott (Loyola Law School-Los Angeles), Leo Martinez (UC Hastings Law) and 2019 AALS President Vicki Jackson at the Second Meeting of the AALS House of Representatives. Other challenges confront the press, which plays a key role in democracy by investigating and reporting on matters of public concern. In what Martha Minow calls the “changing ecosystem of news,” social media may spread inaccuracies; rumors go viral; extreme positions cascade; fake news spreads. Foreign powers use cybertools covertly to influence voters with disinformation, which takes time and resources to uncover. Yet reputable news sources face increased financial constraints; investigative journalism has been losing its institutional infrastructure for decades. Verbal attacks on the press escalate, and journalists are increasingly targeted by violence—in Annapolis, Paris, Istanbul, and elsewhere. Other knowledge-generating organs include some government offices: The Census, required by the Constitution, counts population every ten years to fairly allocate seats in the House of Representatives—a very close connection between knowledge and representative democracy. Many federal entities exist to gather information as a basis for policy—the National Oceanic and Atmospheric Administration, statistical offices in the Justice and Agriculture Departments, the EPA, and many others. But if government offices are not reliably gathering data, or making it public, or prohibit their scientists from participating in academic events, the ability of these entities to provide epistemic support for our constitutional democracy declines. What can law schools do to further explore knowledge-creating institutions’ relationships to constitutional democracy? First, consider how law sustains those institutions—think of legal protections for the press, or for academic freedom and scientific inquiry. Second, explore how law’s development is itself dependent on knowledge-producing institutions. Consider Ida B. Wells, a journalist and activist, born in slavery, who—despite death threats—gathered data to campaign against lynchings. “The way to right wrongs,” she said, “is to turn the light of truth upon them.” Law reformers have a real stake in protecting knowledge generators. So, we might ask ourselves and our students to examine both rights and the institutions that, separately and together, advance knowledge. We might bring together different legal areas—not just free speech or higher education law but corporate law, antitrust, national security law—to better understand the larger legal infrastructure within which our knowledge institutions function. In closing, let me emphasize two points, implicit in what I have already said. First, in trying to strengthen pillars of democracy, law schools—through scholarship, classrooms and clinics— could improve the study of elected officials, their roles, our aspirations for them, and how they differ from courts. For example, we might ask: Do principle and compromise play different roles for a judge and a legislator? Judges should aspire to principled decision-making under law; but should our elected representatives, at times, aspire instead to make fair compromises? This is only [illustrative] of the questions we might explore. Second, institutions can only do so much—character and attitude matter. Perhaps we need to model, and encourage in our students, forms of lawyerly civic virtues that support constitutionalism and democracy—including open-mindedness, integrity and courage—as we heard in Justice Cameron’s talk earlier this week. I had the great privilege to clerk for Justice Thurgood Marshall, an exemplar of moral and physical courage over and over again in his legal work. Lesser known, but emblematic of many government lawyers with integrity, is Louis F. Post, a Labor Department official, who, in 1920, refused to carry out mass deportations of immigrants swept up in the Palmer raids—because of his knowledge of the law, and the facts, and despite being denounced and threatened with impeachment in the U.S. House of Representatives. As their stories show, positive change can happen, and threats to basic values resisted. Can we help foster the courage to stand up for equality and against lack of respect for the human dignity of any of us? Can we help foster the courage to make compromises that enable government to work? What courage and integrity require of lawyers in different contexts is, of course, subject to good faith disagreement. Law schools are great places to have these debates, in our scholarship and classrooms—if not there, where? Today’s challenges to constitutional democracy—disrespect for law and its institutions, for elections and representatives, and for knowledge-producing institutions—can be mutually reinforcing. But so, too, can strengthening these pillars. There is reason for hope. Surveys show that college graduates, of both parties, feel positively about their own college experience. The public expresses willingness to spend more tax dollars on higher education to improve accessibility. This is particularly important: the AALS Before the JD study found significant barriers for first-generation college and law students that will take resources and commitment to overcome. Our study also found that students are considering law school for quite public-spirited reasons. So, I have every confidence that law schools and the lawyers we produce will continue to be key supports for American constitutionalism and democracy. And I look forward to hearing, from all of you, more thoughts on how we, as legal educators, together, can help strengthen the pillars of constitutional democracy.